Are you looking to buy the best pool to have fun with your family? 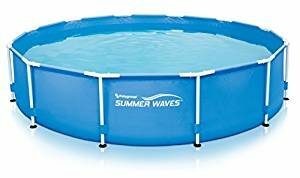 If after going through many options in the market and it all comes down to summer waves vs Intex pools, then this guide is for you. We will comprehensively compare Summer waves pools to Intex pools, citing the similarities, differences and every other detail that you need to know to make an informed decision on the right pool to buy. If you are looking for a straightforward answer on the Summer Waves vs Intex pools without going through the lengthy review, then Intex pools are much better and boast a better customer satisfaction rating. See the list of best rated Intex pools through the button below. 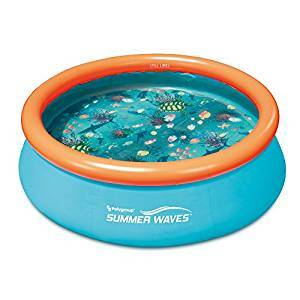 Summer Waves pools are made by Summer Backyard, one of the top leaders that make and market outdoor entertainment products such as pools, inflatable toys, replacement parts and pumps. They have built themselves a good reputation in the market and entertainment arena, thanks to the high quality products that they sell. 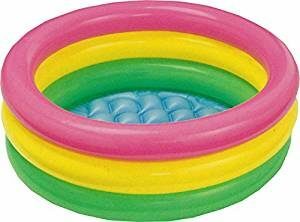 Their other less known brand is the Summer Escapes which also make pools, but they are identical to the Summer waves pools. Above the ground pools are among their top products and there are a number of options and sizes to choose from. Below are 3 of their best selling pools. This is a good family size pool that is sturdily constructed using a 12′ X 30″ metal frame. Easy to assemble, loved for the good durability and it comes with a Skimmer plus filter system. 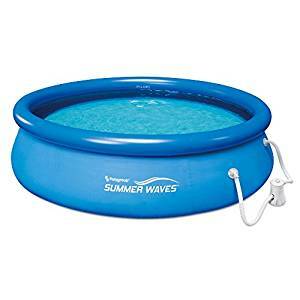 By far, it is the best selling pool by Summer Waves. If you are a fan of inflatable above the ground pools, then this one to consider. It is 10 feet in diameter and can hold up to 1,052-gallons of water, enough for a whole family. Although there are concerns with the durability of these pools, it still is a good choice for low price tag. This nicely built 8 foot pool is designed for kids and the designs including the Aquarius 3D images is sure to please any kid. Many people seem to love it, although there are a few flaws that need improvement on the pool. It is also worth mentioning that you will need to get a filter pump which is bought differently. 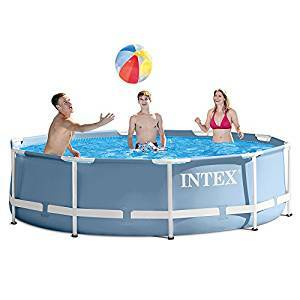 Intex is a US company that has been around for quite some time and is well known for their high quality outdoor and entertainment products that range from airbeds, pools, hot tubs, spas and pools. Intex pools have inspired lots of positive reactions in the market with their amazing quality and performance. their pools are designed using different materials and come in a variety of shapes and designs, giving buyers a wide range to choose from. Prism shaped, metal framed, inflatables are just a few of the designs that one can get. Here are 3 of the best selling Intex pools in the market. This metal frame pool comes with a very high customer satisfaction rating than any other in the market, thanks to the solid build that also has tough PVC liners. It comes with a high quality Krystal clear filter pump and measures 12 feet in diameter offering enough room for a whole family. The pool is easy to assemble and very durable. It is the best pool you can get from the two brands. Built with a very strong structure, this prism frame pool which is also enhanced with a steel tubing for more sturdiness, is one that you are sure to love. It is 12 feet in diameter and uses a unique hydro aeration technology to improve circulation and filtration. It also has a good customer satisfaction rating. 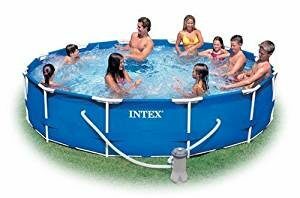 Measuring 34″ by 10″, this is Intex’s most popular kid pool which has an amazingly high customer satisfaction rating. It is well built, is of good quality and reliable. Besides this, there are lots of other kid pool designs that suits kids of all ages from as young as 1 year olds. To further break down these two brands and give you a more comprehensive overview, here is a criterion based comparison of the Summer Waves and Intex pools. Among the most crucial things when you are buying an above the ground pool includes structural design and overall sturdiness. It is this that will determine the quality and durability of the pool that one is getting. 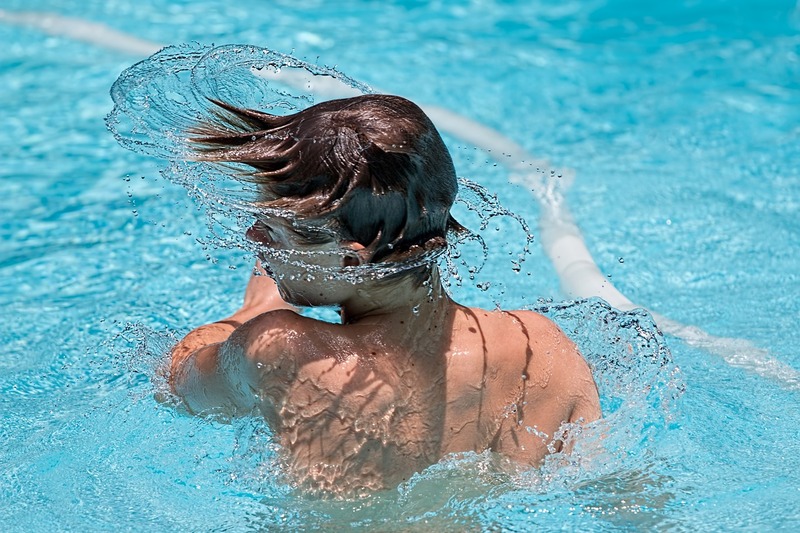 By comparing Summer Waves pools to Intex pools, there are some that are close in structure similarities and others that vary greatly. Summer Waves only use metal frames in their structure while Intex pools use metal frames among other materials such as powdered and coated steel. Intex thus offers more choices to choose from and have proven to have the upper hand than Summer Waves pools on this. When choosing a pool, either for adults or for kids, you have to make sure that it is easy to clean. hygiene is very important and you wouldn’t want something that keeps micro-organisms and bacterial germs as this can be detrimental to your family’s health. The good things is that with both Summer Waves and Intex pools, this is a non-issue and something that has been well taken care of. Cleaning any of these brand’s pools is easy and totally hassle-free. Customer ratings is a good indicator when you are buying something and in our case, that includes above the ground pools. It will give you a better understanding on what to expect and whether the pool you want to buy is exactly what you are looking for or whether it will end up being a disappointment. Comparing the Summer Waves to Intex pools on customer satisfaction, where we went through thousands of customer ratings from over a dozen sellers online, we can easily conclude that Intex is a much better option to go with. Most of their pools have high customer ratings and lower return rate than Summer Waves which we found more customers having more than a few things to complain about. It is also worth mentioning that Intex pools do provide a wide range of pools to choose from, as compared to Summer waves. Some people may want a whole family pools, others would want to have only kid’s pools which vary in different sizes and when it comes to this, you’d want to go with Intex rather than Summer Waves. When it comes to pricing, there are pools of all kinds from both brands. However, there are only a few to choose from with Summer Waves than you would find with Intex pools. If you are therefore looking for a good option with a wide range of pricing, then check out the Intex pools. Above the ground pools have become more popular than ever, and with the simplicity and ease of getting them installed yet still enjoy the same fun, or even better than you would with underground pools, there is no reason why you shouldn’t have them. They give you the freedom of having a family vacation on your own backyard at a fraction of the cost. Summer Waves and Intex ranks among the top above-the-ground pools and hopefully, with our Summer waves vs. Intex pool comparison, you can make an informed decision on which one to go for. Clearly, Intex is a more superior brand and one that guarantees you better performance, quality and fun. For a full list of best selling Intex pools for the money, click on the button below.